Includes pictures of available rescues, application, and rescue stories. Breeder Kathleen Mallery of Castell PWC Kennels rescues in the Idaho/Eastern Washington area. Idaho Fishn Hunt brings the Idaho angler and hunter up-to-date on-line magazines about fishing and hunting in Idaho, from Idaho, by Idahoans. The Idaho affiliate of the USTA. Provides information for tennis tournaments, clubs, and players, and rankings in Idaho. Use this one-stop tour guide to plan your own tour of Idaho wineries and learn about Idaho wines. Lodging and dining information also included. Comprised of ATV riders throughout Idaho who are looking for new places to ride, new people to ride with, or are concerned about the land access issues in Idaho. Official website of this Pioneer League minor league baseball team located in Idaho Falls, Idaho. Camping resources for Idaho, featuring the diverse outdoor destinations of the North Idaho Panhandle. Website for the Idaho British Car Club. A home in Idaho for Triumph lovers! Pictures, pedigrees, and breed standard. Shelley, Idaho. Idaho commercial soaring operations, locations and general information. The Idaho chapter holds monthly meetings and family events as well as cruises and shows. Various aspects of the club can be found on this site. Located in Southwestern Idaho. Calendar of events, membership details, and listings of club officers. Idaho outfitter referral service for fishing as well as elk, deer, bear, and mountain lion hunting. A listing of ski resorts in Idaho, including mountain and area statistics, trail information, and current conditions. The Half-Mind Catalogs listing of contacts for all Idaho Hashes, maintained by Flying Booger. List of breeders and general breed information from Idaho Fish n Hunt - Idaho Afield. Collector specializes in collecting flat top and cone top beer cans and other breweriana from Idaho and Montana. Featuring news, schedules, profiles from OMC Speedway a 1/8 mile banked clay oval in Southwestern Idaho. Idaho team coverage, statistics, scores, standings, transactions, injury reports, schedules, and rosters. Supported by Bonneville Post 56 in Idaho. Includes officers and coaches, calendar, code of ethics, and roster and schedule for three teams: Reds, Russets and Rangers. Provides skilled nursing and assisted living services in Idaho Falls. Guide to the wildflowers that grow in the mountains of Idaho, with descriptions and illustrations. Ski links for Idaho resorts including snow reports and weather forecasts. If the business hours of Idaho Welsh Corgi Rescue in may vary on holidays like Valentine’s Day, Washington’s Birthday, St. Patrick’s Day, Easter, Easter eve and Mother’s day. We display standard opening hours and price ranges in our profile site. We recommend to check out angelfire.com/id/castellpwc/CastellRescue.html for further information. 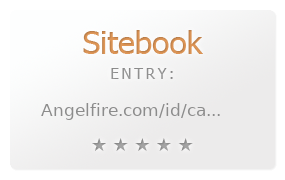 You can also search for Alternatives for angelfire.com/id/castellpwc/CastellRescue.html on our Review Site Sitebook.org All trademarks are the property of their respective owners. If we should delete this entry, please send us a short E-Mail.